When the Classics Club Spin chose To the Lighthouse for me from my list, I wasn’t sure how pleased I was. I first read it in college and remembered very little of it except that it wasn’t my favorite. On the other hand, our tastes change as we grow, and I had enjoyed Mrs. Dalloway. The novel is divided into three sections. The first is about a day in the life of the Ramsey family, as they vacation on the Isle of Skye with their friends. The second is about the house and the passage of time. The third takes place there again ten or eleven years later. Young James Ramsey has been begging for a trip the next day to the lighthouse, and both he and Mrs. Ramsey are irritated with Mr. Ramsey for so assuredly stating that the weather will be too stormy. The novel revolves around the presence of Mrs. Ramsey, a beautiful, quiet, assured mother of eight. Although we briefly see things from other characters’ points of view, the most prevalent are those of Mrs. Ramsey and of Lily Briscoe, a painter. Nothing much happens in this part of the novel. 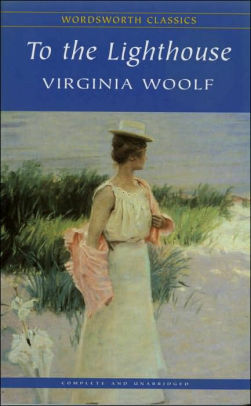 The family doesn’t go to the lighthouse; Lily has difficulty with her painting, and although she has insight during dinner, she doesn’t finish it; Minta loses her brooch on the beach and accepts a proposal from Paul; Lily resists Mrs. Ramsey’s old-fashioned idea that she must marry and her attempts to pair her off with William Bankes. The action of the novel isn’t really the point, though, it’s the complex relationships between friends and family. At times the narrative is a little hard to follow, because Woolf switches time and pronouns so that you don’t always know whether something takes place in the novel’s present or past or who is being referred to. The novel is impressionistic in its approach, both in its descriptions of characters’ thoughts and of the settings. Over everything is the strong presence of Mrs. Ramsey. Time passes, the war intervenes, and the family does not return for more than 10 years. When it does, things have changed. I enjoyed reading this novel, although I’m sure I missed a lot. I think it could be food for study and contemplation, but I did not have time to do so.